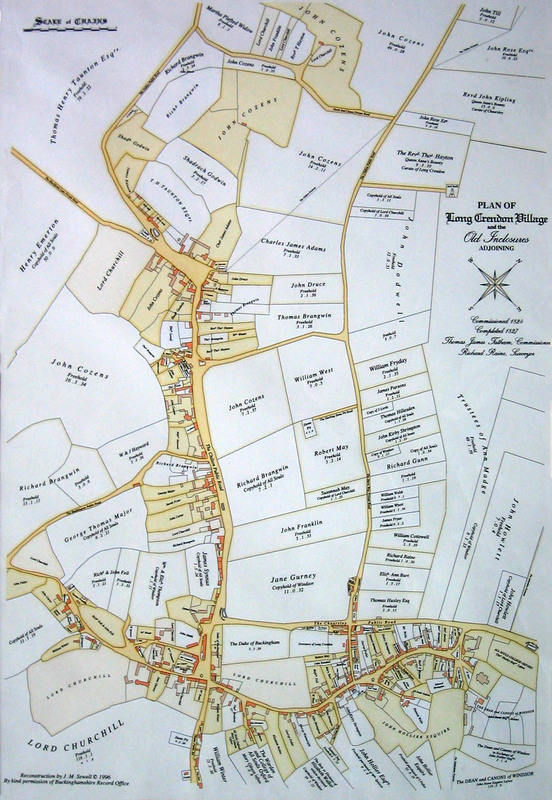 Long Crendon or simply Crendon, as it was known in the Middle Ages, has a long archaeological history. At Church End a concentration of artefacts from the Iron Age, Roman and Saxon periods have been unearthed. After the Norman invasion of 1066, the manor of Crendon was given to Walter Giffard, Lord of Longueville, one of William the Conqueror's major supporters. The Giffards are said to have chosen Crendon as their chief manor and built a castle, which may have been destroyed in 1233. Foundations of a large building existed in 1705. In 1162 the Giffards founded the Augustinian abbey of Notley in the south-east corner of the parish. The Giffard lordship of the manor descended in 1191 to William Marshall, Regent during the minority on Henry III, and then was subsequently divided between the three families of Bohun, Hastings and Mortimer. The Bohun third of the manor was held for a time by Henry V's queen, Katherine de Valois, and later by Edward IV's queen, Elizabeth Woodville. 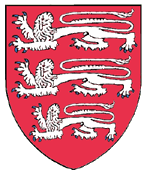 In 1442, Henry VI gave the Hastings third to All Souls College, Oxford, and in 1479 the Bohun third was granted by Edward IV to St George's Chapel, Windsor. 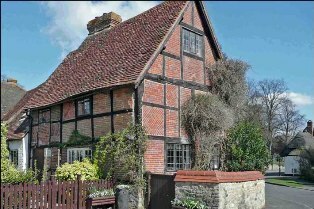 The Mortimer portion was bought in 1520 by Sir Michael Dormer, a Wycombe wool merchant. 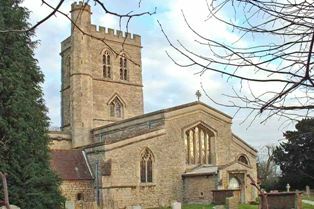 St Mary's Church, north-west view. The Church of St Mary has signs at the west end of having originally been a Norman foundation. Under the patronage of Notley Abbey, it was largely transformed in the 13th century. Until the abbey was dissolved in 1538, the parish was served by one of the canons. Notley Abbey, after its suppression in 1538, was allowed to fall into ruin and quarried for its stone. The exception was the abbot's lodging which had survived as a farmhouse before being converted in the last century into a country mansion. The church, longer than Christ Church Cathedral, has disappeared but fragments of the cloister remain. 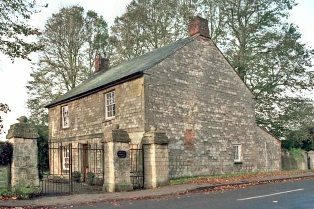 The Manor House, Church End is a square brick building of 1660 in the Classical style, which was given its present title by a 19th century tenant. It functioned as the demesne (or home) farmhouse for the St George's portion of the manor. 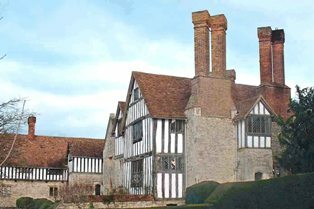 Long Crendon Manor, Frogmore Lane, has a 14-16th core that was restored and extended in 1920 by the architect Philip Tilden, the restorer of Chartwell. The house had belonged to the estate of William Loveden (c.1390). It was sold in 1764 by Lord Abingdon, along with the manors of Notley Abbey and the St Christopher Chantry, to the Duke of Marlborough. It then served as the Duke's demesne farm. 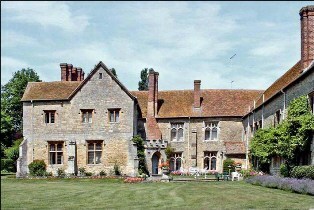 It has become known as Long Crendon Manor in order to distinguish it from The Manor House at Church End. 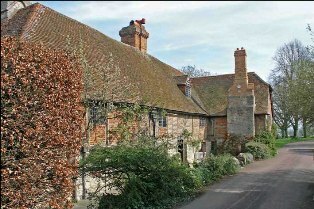 Crendon has nearly 100 properties listed by English Heritage. The absence of a resident lord of the manor has meant that many old properties were not rebuilt but survived into the 20th century. 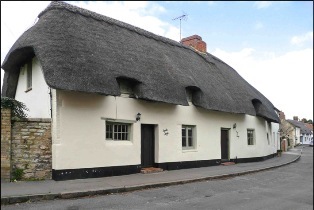 By then the picturesque appeal of a thatched country cottage had become fashionable and outsiders were attracted to the village. Adjacent two-room cottages were combined and modern extensions added out of sight at the rear. This has meant that the frontage of the High Street looks more or less as it did in 1900, except for a smaller number of front doors. 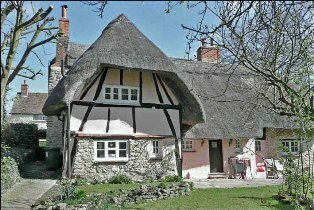 As well as properties in rubble stone, there are timber frame buildings infilled with wattle and daub or brick, such as Well Cottage, 27 High Street. One owner in the 1930s employed William Joyce (Lord Haw-Haw) and rumour suggests that he may have invited Joyce to the cottage. More humble dwellings were often of witchert, a mix of clay and straw, rendered with lime plaster. Bracken Cottage, 8 Chearsley Road, is of this type and was originally composed of three cottages. 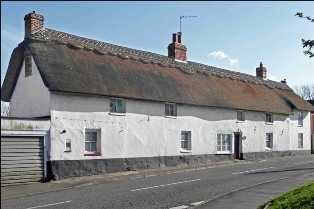 Madges, 55 High Street, may have been the home farm of the Dormers when purchased by Richard Madge in 1612. It was given an 18th century brick frontage, and more recently the barn on the left of the gateway has been converted into a residence. Tompson's Farm, Wapping, is a 15-16th century timber-frame house that was in a very sad state in 1934 when it was carefully restored and extended. Henry Tompson, after whom the farm is named, paid his token rent in 1614 with needles, which might suggest that needlemaking was by then a village industry. Sycamore Farm, 9 Bicester Road, has interior timbers with a tree ring-date of 1205. 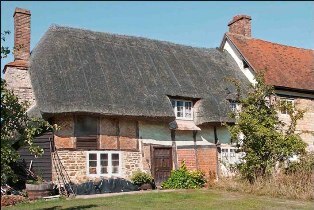 It is amongst the eight oldest inhabited wooden-frame buildings that have so far been identified by dendrochronology. The Mound, Lower End, is another timber-frame house and a conspicuous landmark for those entering the village from the Bicester direction. 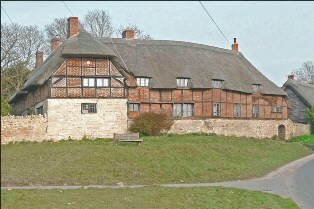 Sir Lawrence Gomme, secretary to the London County Council, renovated and sympathetically extended the old Emerton's farmhouse in 1902. 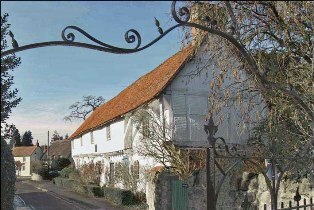 Dragon Farm, Lower End was the home of Joyce Donald, the author of Long Crendon: A Short History. In 1544, Christopher Greening, reputed to be the first in England to make steel needles, became the tenant. Tree-ring dating has suggested that he was responsible for the building of the oldest part of the house. 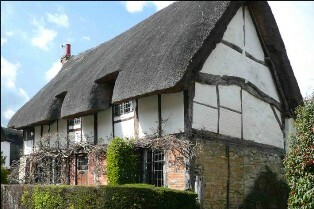 The Cottage, Church Green, is one of twenty-two examples in Crendon of cruck or A-frame construction. This technique required the splitting of a tree trunk into two matching blades, which were then linked by a tie-beam near the apex. They are rarely visible from the outside. 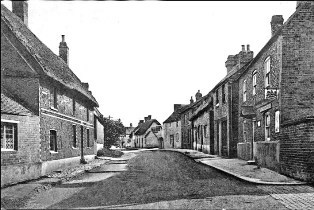 Crendon was an early centre of the steel needlemaking industry introduced into this country in the mid-16th century. It is claimed that the necessary skills were brought across from Europe in 1560 by a Crendon man, Christopher Greening. The first accredited Crendon needlemaker was John Warwick, in 1679. His family home was at Warwick Farm, 31 Bicester Road. 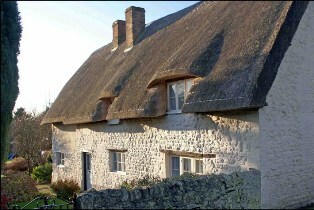 Needlemakers' cottages existed at various locations in the village. At 7-9 High Street are two cottages with a communicating cupboard through which partly-processed needles could be passed. In 1848 Kirby, Beard & Co set up a factory at what is now the Old Needle House, 23 Chilton Road. Across the road the company erected a row of workers' cottages. 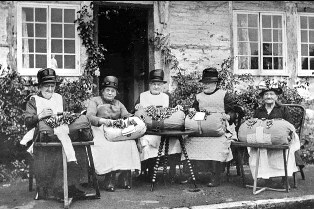 As in many other Buckinghashire villages, women and girls were engaged in lacemaking as a means of augmenting the meagre farm labourer's wage. The introduction of machine-made lace strangled the craft, although it survived amongst a few elderly villagers into early 1900s. Written by Eric Sewell 2009. 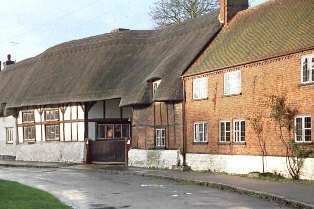 For more information on Long Crendon’s History, please refer to Long Crendon: A Historical Miscellany 1 & 2 by Eric Sewell or Long Crendon: A Short History by Joyce Donald. On sale at the Long Crendon Post Office. 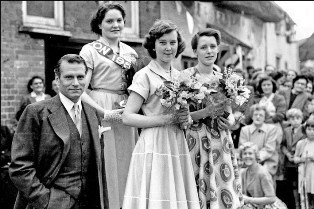 If you have any information about Long Crendon or its inhabitants, or any stories of interest, please start a new discussion within the public discussion forum.